Autism Awareness Bracelet Adult size: Prices reduced for a limited time! 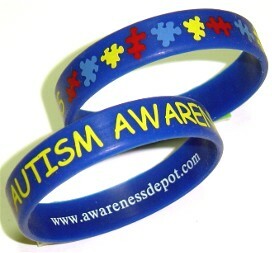 New, debossed with color fill Autism Rubber Bracelets. These autism wristbands are NOT screen printed. This is a top quality bracelet with colors that will NOT rub off like some others. We have gone through the extra expense to give you the top of the line quality at a great price. Safe - Non-Toxic. Made of latex-free silicone. All our silicone bracelets are 100% lead free. Hypoallergenic and safe to wear. Bright colors with traditional Autism puzzle pieces surround the ENTIRE bracelet. The words Autism Awareness is debossed and filled in with yellow ink. These are great for Fundraisers! This image is a front and back view. Size: Adult 8 inches.